Nokia X6 is a touchscreen smartphone within a compact and square for music lovers, since it provides up to 35 hours of uninterrupted music. Not to mention the 36 GB of internal memory that stores a large number of tracks and more. other specifications of the phone include support for UMTS network, HSDPA, 3.2-inch display with 360×640 pixel resolution, Wi-Fi connectivity, a 5 megapixel camera with autofocus and LED flash, integrated GPS receiver with Ovi Maps on Symbian OS v9.4 S60 fifth edition, video calling, media player with graphic equalizer, playlists and other advanced features to play music at its best. 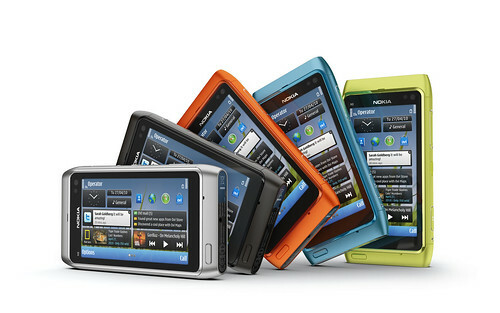 Nokia N97 can safely be said to be among the most powerful feature rich phones that nokia have ever made. The Nokia N97 is a S60 5th Edition mobile computer with a large 3,5“, bright nHD (640 x 360 pixels and 16:9 aspect ratio) TFT color display with resistive touch screen and tactile feedback. The device provides excellent user experience for internet and entertainment by combining qwerty keyboard with touch UI and Home screen functionality. Use the N97 to connect to mobile broadband using WLAN or HSDPA (3.5G). Find directions and locations with the integrated A-GPS and included maps. Additional features include game titles with N-Gage, a 5 mega pixel camera with dual LED flash and automatic geotagging of images and videos.